Engaging lessons are critical for student success. 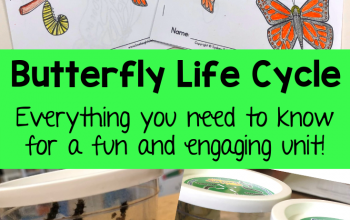 Research has shown that students remember more and retain more information through hands-on, engaging material. One strategy to help students become more engaged in their learning is to get students up and moving. The mystery games I create do exactly that. From the introduction, students’ imaginations are captivated and they’re eager to participate. 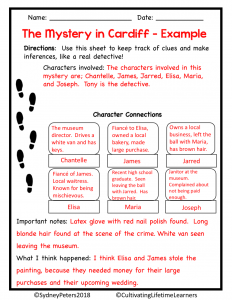 In these lessons, the teacher introduces the mystery by reading an introductory story with just a small amount of information to get students thinking. There are several ways to conduct the mysteries and these are the three ways I’ve seen it work best. Students are broken up into groups of 3 or 4. The teacher gives each student one clue. Students share their clues with the other students in their group and have a small discussion. Once students have shared in their clues, each group combines with another group to share clues again. This keeps going until all clues have been read by each student. If your class has difficulty following directions or if they’re below 5th grade, this might not be the best option for you. A second way to play is to tape the clues around the room and have students go on a clue hunt. You may want to mark each clue with a number so students know which clues they have read. This is my favorite way to play. The third way to play is to have students read the clues aloud. Although this is not my favorite way to play the game, it is a time saver. I like students to be able to get up and move and this option doesn’t allow for much movement. 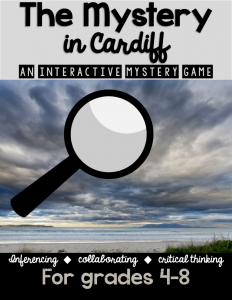 Regardless of the way you play, you’ll want to make sure that each student has had access to each clue. Students are provided a graphic organizer to keep track of the information. I allow students to chat amongst themselves about what their theories are before I bring it into a whole class discussion. Students get really creative with their theories and they love debating with one another about what happened, why it happened, and who did it. Without even realizing it, students are working on many skills, including; inferencing, critical thinking, problem solving, speaking and listening, and much more. The mysteries align with the Common Core State Standards for speaking and listening from 3rd to 8th grade. Who knew you could have this much fun learning! There are over 25 mysteries to choose from. Here is a free sample to get you started. If you like it and your students have fun, come back for more! 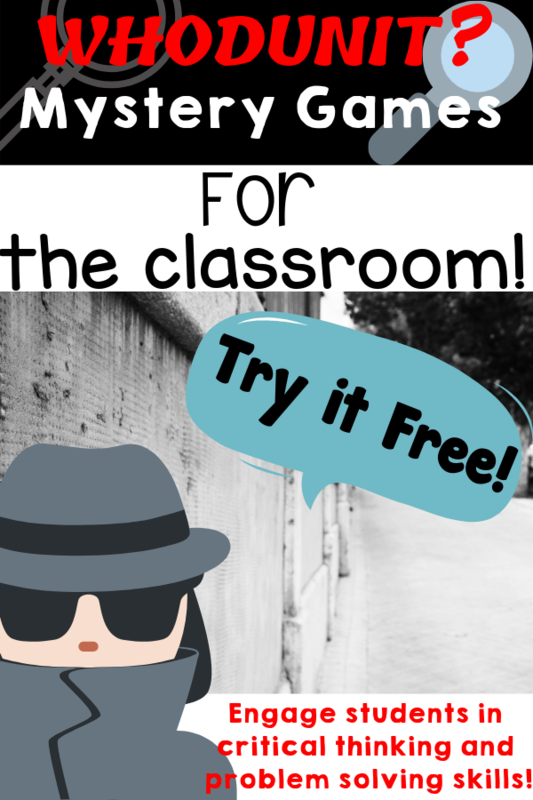 Thousands of educators have used these games with their classroom and love them! Here is what other educators around the world are saying about these games. “We did this activity today. It was totally awesome! My students were so engaged the whole time! Each class had about 45 minutes, which was enough time for the 7th and 8th graders, but my 6th graders needed a little longer. Try it for free, click here!